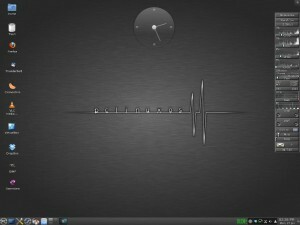 These days there is a plethora of Linux distributions to choose from, essential they all offer a desktop computer operating system. In the same way that Windows is the basis for operations on your PC, Linux offers an alternative, that is recognised as the third player in the desktop operating system space. Essentially users may now choose from Windows, Mac or Linux and can expect a well presented and easy to use computer system. “Discovering a right little Gem!”. I had taken to throwing a few LiveCD based distributions (distro) into the laptop drive just as a play about really. Having flicked through a few of the top slot popular distro’s without much standing out to me. My laptop, has a rather odd delay in spinning up the DVD drive, and this often catches live distro’s out as they abandon their attempt to read the DVD because it doesn’t get mounted quick enough. PC Linux OS impressed here, as it realised the DVD was unmounted, and simply noted the fact and announced it was waiting for the drive to come online, Nice one ! I think that the first thing many newbie users will appreciate about this distro, is that it comes preloaded with patent encumbered drivers. I was very impressed to see the Nvidia splash screen meaning that 3D acceleration was working out of the box. After a few more seconds the system had booted and automatically logged me in, only pausing to present me with a little notification box giving me passwords for the local user and root (Administrator). The desktop in this release is KDE 4.6.4, I am afraid I have to admit a slight conflict of interest here as I am a big fan of KDE and use it as my everyday desktop. The layout is clean and well put together, with a Docky / MAC OSX style application dock, the icon set is a little disjointed and would benefit from some coordinated design work, an area where Ubuntu really shines. However, I really liked the application choices and I think Windows users perhaps exploring Linux for the first time would find PC Linux OS offers a comfortable and intuitive look and layout. It’s very clear that its not Windows and it lets be clear, it doesn’t look like Windows, but the feel is very similar and that’s likely to enable Windows users to get comfortable quickly. The Introduction of Activities in KDE has caused plenty of confusion. Activities are included with PC Linux OS, and you are going to love them. Let me explain; Activities are just like having multiple PC’s in one machine, except that you can switch between them in an instant. Perhaps you like video editing, and developing; KDE makes it easy to set up an Activity for your daily general use. You can add new widgets and set up applications that are already open and ready to go when you login. Click on the aptly named Cashew nut in the top right of the desktop and select Activities, and click Create New. Perhaps call this one Video, an icon for the activity appears bottom left. When you click on the new Video Activity icon suddenly your daily desktop vanishes and you’re back to a clean set up. Proceed in the same way as before, set up the widgets and applications that you want to use for Video editing. Repeat as above and create another activity for developing. Now to move from one activity to another simply click the Cashew and click on the activity you want to use and you’ll be instantly transported from one set up to the next, and back again if you wish, pretty neat ! Continuing my explorations I loaded the Clementine music player, and found that it must be a fork of Amarok before the dev team turned the interface into an unusable munter. I was very very found of this earlier version of Amarok, but even more impressive was the fact that MP3 playback was working out of the box, no downloading codecs or confusing messages. If you want new users to stick with your distro this is better than dipping the distro CD in glue, and the cherry on the cake ? Wireless networking out the box, Check. As a final element to encourage you to give PC Linux OS a try is the very slick Computer set up tool. Based on Mandrake tools this works really well even from a temporrary live system. I used the “Configure your computer” tool to configure FTP, it prompted me that Proftp wasn’t installed and asked did I want to install and configure it. I replied yes, and was asked for the root (administrator) password. From there it went off installed Proftpd, asked me a couple of simple questions using Windows style dialog boxes configured the FTP daemon and started the service, very nicely put together. Having done plenty of work putting distro’s together and configuring different systems PC Linux OS is a real pleasure to work with and I give Credit and Kudos to the development team and the community around PC Linux OS. The distro’s been around since 2003 and their experience shows in a really polished product.